Out of all of the seasons, I love the summer most. Not just because of my lazy poolside days, baseball games, refreshing beverages, or little summer dresses, but because of the abundance and variety of incredible produce. It is something that people in California take for granted. Every year we grow a couple of cherry tomatoes plants in out backyard. My son can hardly wait for them to ripen and as soon as they do he eats them right off of the plant. Sweet, warm, vine ripened tomatoes. Yummmmmm…there is nothing like them. We seem to have a bowl full on our counter all summer long. The other veggie we seem to never get enough of during the summer is zucchini. 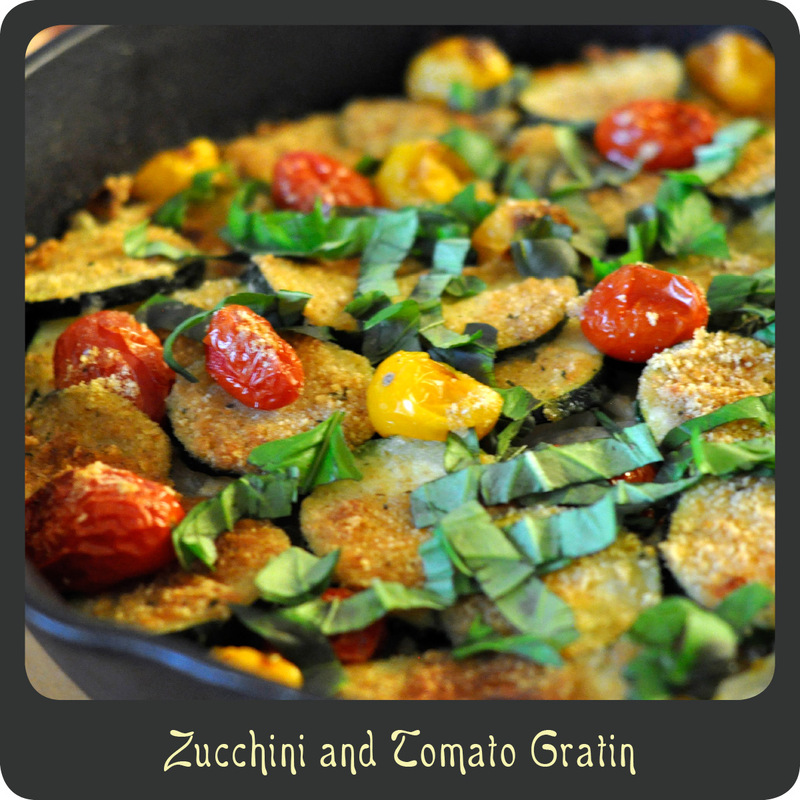 Zucchini and tomatoes are a wonderful pair, and when you add in some quality parmesan cheese and fresh basil, delish! When I first tried this recipe for zucchini and tomato gratin I knew it was a recipe I would be making all summer long. Serve it up on it’s own with some pasta or as a side with your favorite protein, either way it is a perfect summertime dish. Drizzle a little olive oil in the bottom of large cast iron skillet. Separate the onions rings, place them in the bottom of the skillet, and drizzle with a little olive oil. Add half of the sliced zucchini, half of the leeks, and all of the garlic to the pan. Sprinkle with a 1/2 cup of the parmesan cheese and a 3/4 cup of the breadcrumbs. Drizzle with additional olive oil. Add the remaining zucchini, remaining leeks, and all of the cherry tomatoes to the pan and drizzle with more olive oil. Sprinkle with the remaining 1/2 cup of the parmesan cheese and a 3/4 cup of the breadcrumbs. Drizzle with a tad more olive oil. Bake entire pan in the oven for 25–30 minutes. Turn on the broiler and finish the dish off under the broiler for 2–3 minutes or until it is golden brown on top. Recipe adapted from Proud Italian Cook. One of my son’s first favorite foods was cheese tortellini smothered in alfredo sauce. I personally love alfredo sauce over fettuccine noodles and served with a grilled chicken breast and some broccoli. 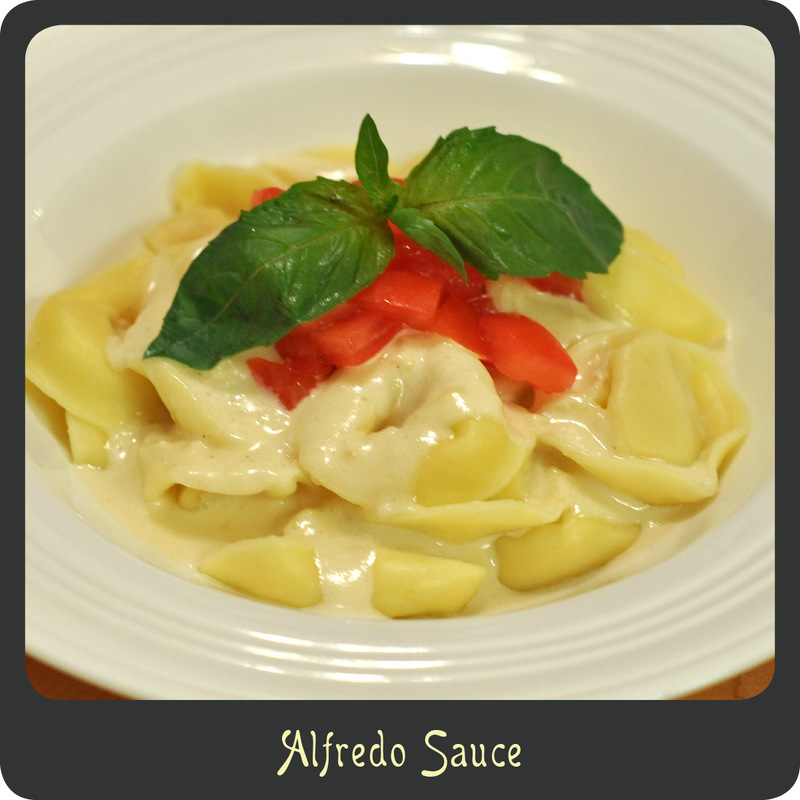 Either way alfredo sauce is a great indulgence to enjoy anytime. Who doesn’t love the thick creamy Italian cheese sauce over their favorite pasta? It is popular with people of all ages and can be extremely versatile. I have even used it as a white pizza sauce or poured over a baked potato. Homemade alfredo sauce is actually really easy and quick to make and so worth it. The quality does not compare to anything store bought. Give it a try! It will be a home run with the whole family! Note: If you want a high quality sauce equal to that of one served in a restaurant (or better) use high quality ingredients. I recommend getting a fresh ball of mozzarella and a block of Parmesan over in the deli. You will notice the difference! Kraft will leave it gritty and we want it to be smooth. In a large saucepan over medium heat melt the butter and add olive oil. Add the garlic and sauté for 1–2 minutes. Carefully pour in the wine and heat until it begins to simmer. Stir in the heavy cream and the white pepper and bring to a simmer stirring often. Add in the Parmesan cheese and simmer for 8–10 minutes. By this point the sauce should be smooth and start to thicken. Add the mozzarella cheese and stir frequently until smooth and completely incorporated. Reduce heat to low and begin cooking your noodle of choice while the sauce simmers and continues to thicken. Remove sauce from the stovetop and allow it to sit for a few minutes. It will thicken up a bit more. Serve sauce over cooked pasta.